The resources available today to assist sales reps with closing more deals is boundless. There are systems that log your phone calls, software that tracks the number of times your email was opened by your prospect, and CRM’s to help fill your pipeline. These tools are all great, but they still lack one thing — actually getting your customer to sign on the dotted line. So when PandaDoc looks for sales tools to integrate with, we want to make sure that we align with the product in the way of completing the sales funnel, an entire end-to-end sales solution. 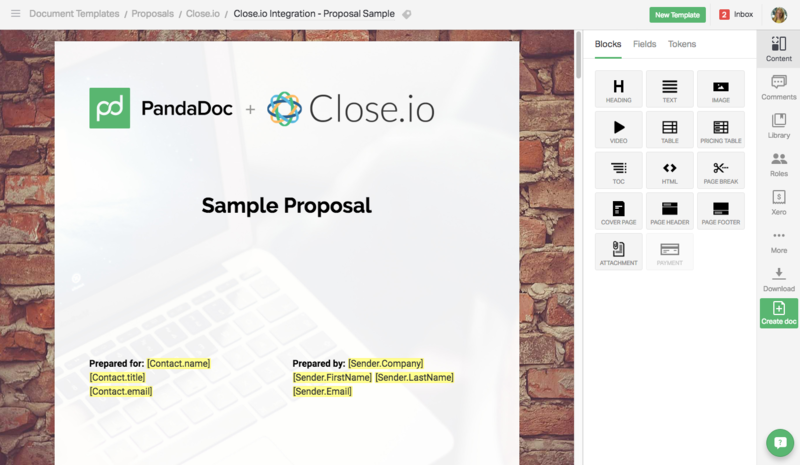 Our newest integration with Close.io is just that. 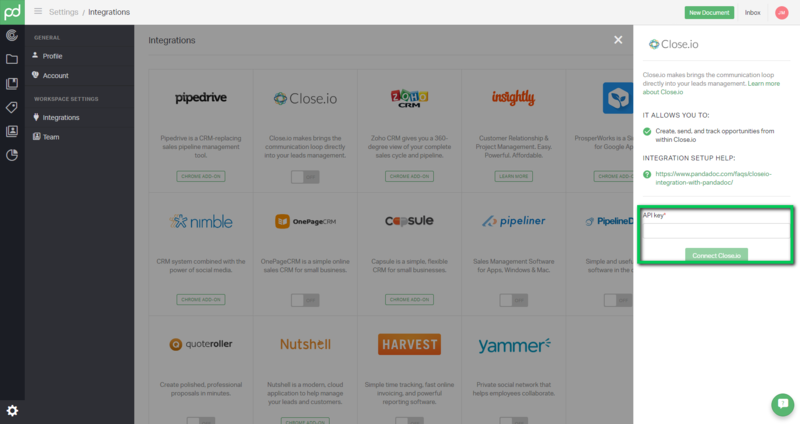 Close.io auto logs calls, emails, and sales activity. Now combined with the power of PandaDoc, sales reps can create quotes, proposals, contracts, receive signatures and track deals right from Close.io. PandaDoc takes the Close.io Opportunity data you are already viewing and merges it with your documents. By integrating the two platforms, we are greatly reducing the manual back-and-forth often needed to create any client-facing document. 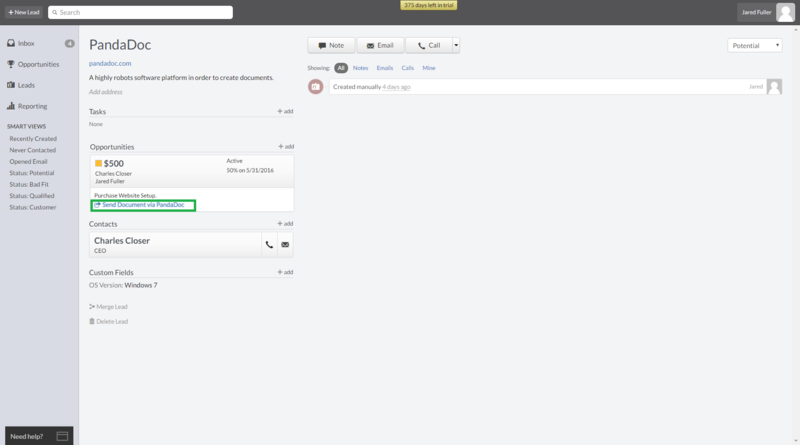 Now, you have the ability to create templates for all of your sales documents from within your PandaDoc account. To merge the data directly from Close.io, tokens are used as placeholders for recipient information such as first name, last name, and email address. How do I connect the integration? You will first need to find and copy your API key within Close.io. This is located within your settings, under Your API Keys. Once you have located and copied the key, head to settings within PandaDoc, paste the key into the API key field box and click Connect Close.io. When you are ready to send out your first document, you will access the PandaDoc platform from the Opportunity page within Close.io. How do I send out a document? 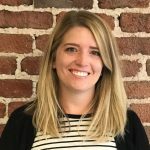 When you are viewing an opportunity in Close.io, the custom data from the page will merge directly into the template to create a new document. All you need to do is make your final edits via the PandaDoc interface and send your document. Once you’ve sent your document to your prospect, you can track its status throughout its entire lifecycle via the PandaDoc platform for easy follow-up. Our newest integration will significantly improve the way you create, send and sign your sales quote, proposals and contracts. Not only will it streamline your process, but it will allow you to spend less time creating sales documents, and more time closing deals. To learn more, get started with a free PandaDoc account today.